Delicious Low-Carb Southwestern Pot Roast in the Slow Cooker has only five ingredients and it’s low-carb, low-glycemic, gluten-free, South Beach Diet friendly, and can easily be Paleo or Whole 30 if you choose the right salsa! Use the Diet-Type Index to find more recipes like this one. Click here to PIN Low-Carb Southwestern Pot Roast in the Slow Cooker! This Low-Carb Southwestern Pot Roast in the Slow Cooker uses canned beef broth and salsa to add southwestern flavor to pot roast that gets tender and flavorful from the slow cooker. I’ve made this pot roast for years and recently I realized this recipe really needed new photos, so I made it recently to take some better pictures of this tasty pot roast! This is one of my easy Five Ingredients Recipes, but please don’t skip the preparation steps of browning the roast and reducing the beef broth on the stove before you add it to the slow cooker, because both those steps add a lot of flavor. You can do that the night before if you’d like, and then put the browned meat, broth, and salsa in the slow cooker to cook all day on low while you’re at work. I always use boneless chuck roast for pot roast, and trim as much fat as possible before browning the meat. When the roast is done, I use a fat separator to remove fat from the sauce or gravy if needed. If you haven’t made pot roast, you can see some pot roast techniques in the recipe for Balsamic and Onion Pot Roast where I share How to Make Pot Roast in a Crockpot. If you don’t have a crockpot, this could be cooked on top of the stove in a heavy dutch oven, just keep the temperature as low as possible, and add a little more liquid if needed. And if you prefer making pot roast in the Instant Pot, check out Instant Pot Low-Carb Southwestern Pot Roast! Start reducing the can of beef broth by simmering it on low heat while you trim the pot roast. 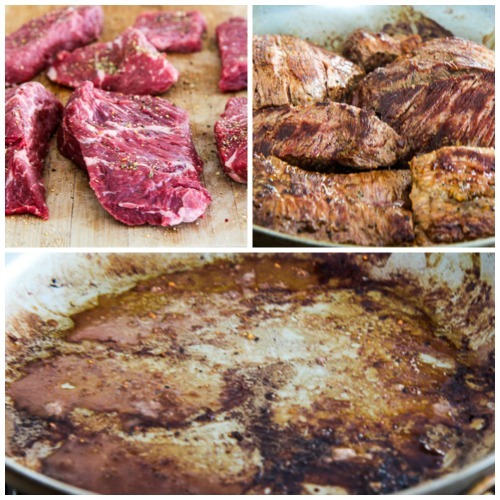 Heat the olive oil in a large frying pan, add the pot roast pieces, and brown well. Put the browned meat into the slow cooker. You’ll have lots of flavorful bits left in the pan. When the broth has reduced to 1/2 cup, add it to the frying pan and use the turner to scrape all the browned bits. Then combine that liquid with the one cup of salsa and pour over the browned piece of roast in the slow cooker. Cook on high for one hour, then turn to low and cook 3-4 hours more, or until the meat is very tender when pierced with a fork. You can also cook all day on low. When the meat is tender, remove it from the slow cooker and pour the sauce into a small pan, spooning off the fat or using a fat separator if needed. Add the final 1/4 cup salsa to the sauce and simmer to reduce to one cup. Serve Low-Carb Southwestern Pot Roast with the sauce spooned over the pieces of meat. 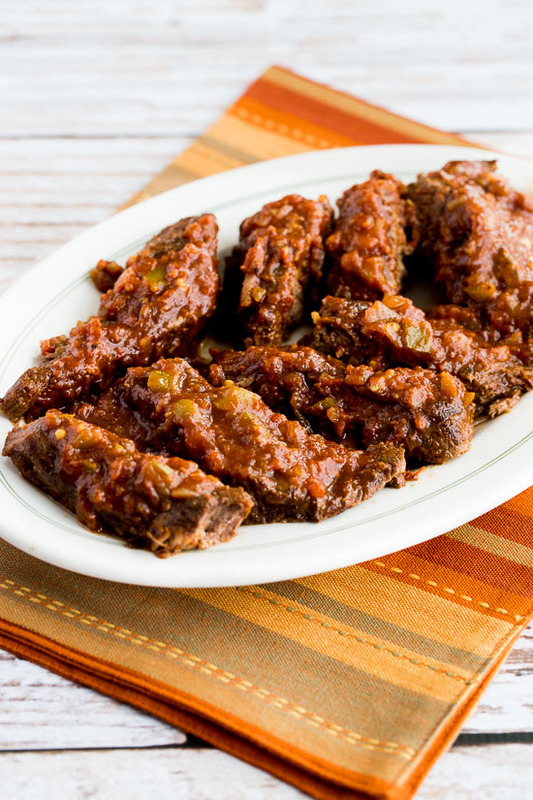 Delicious Low-Carb Southwestern Pot Roast in the Slow Cooker has only five ingredients. Put beef broth in a small saucepan, removing any fat that has collected on top in the can. Simmer on low until the broth is reduced to 1/2 cup. Heat olive oil in heavy frying pan (pans that aren’t nonstick will give the best browning.) Brown roast well on all sides. Don’t rush this step because browning provides flavor, and I think it’s especially important in crockpot cooking. When roast is browned on all sides, put pieces of meat in crockpot, arranging them in a single layer. Pour reduced beef broth into frying pan and use a turner to scrape off any caramelized bits from the browned meat. Add salsa and stir into broth, then pour salsa/beef broth mixture over pot roast. Put meat back into crockpot to keep warm, then add final 1/4 cup salsa to the sauce and simmer until reduced to about 1 cup. To serve, slice meat across the grain or cut into pieces and serve hot, with sauce spooned over the top. I also think this meat would be great served as a filling for tacos, burritos, or quesadillas made with low-carb tortillas. I used my 6-Quart Ninja Cooker Slow Cooker, but it could have been smaller. 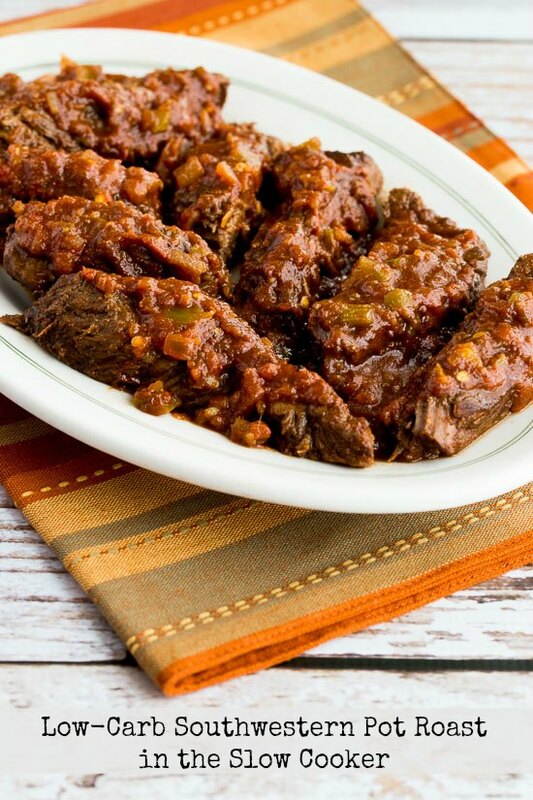 Low-Carb Southwestern Pot Roast is great for any phase of the South Beach Diet as long as you trim the meat choose a salsa that is low in sugar, less than 2 grams of sugar per serving. It would also be great for most other low-carb diet plans, most of which wouldn’t mind a bit of fat. Crock pot recipe making with the guidance of video very helpful and easy to make after watching your provided guidance video. Glad that was helpful for you! Crock pot recipe with the ingredients guidance and making is awesome. Would you be able to do this without a slow cooker. How long would you cook it on the stove top or oven. It says this in the post: "If you don't have a crockpot, this could be cooked on top of the stove in a heavy dutch oven, just keep the temperature as low as possible, and add a little more liquid if needed." I wouldn't be able to tell the exact time since I haven't cooked it that way but I'm guessing it would take several hours at a low simmer. You might want to read this recipe for Stove-Top Post Roast which has a good idea about how to keep the temperature as low as possible on the stove. Reading that post might help answer your questions about timing as well. You're welcome, hope you enjoy them both! The slow cooker does such a good job on pot roast. Love this recipe! Thanks Lydia, It's an oldie but goodie! Wanda, I hope he enjoys it! And I notice all my older recipes say CrockPot, pretty funny. I will cook this today for my 7 yr old grandson. Within the past year, he discovered he loves meat…a meal as tasty as this will appeal to him. He needs to eat more 'to get some 'meat' on his bones.' So thanks much, Kalyn. I also chuckled at the nostalgia of the term we used: 'crockpot' instead of slow cooker. Yet another nice recipe and so simple. Crock pots are awesome for pot roasts and pork roasts. In fact I hardly ever cook a pork roast any other way. Thanks for the recipe. Suzannah, thanks for the nice thoughts about the blog. I'm so glad you're enjoying the recipes and that they're helpful! Tia, so glad you enjoyed it! This receipe was INCREDIBLE! I can't believe how delicious it was, particularly since I don't really like roast that much. I cooked mine in the crockpot on low for about 10 hours, and it was falling apart, moist and delicious. The sauce was such a nice addition, as well. I'm so excited about the leftovers today! This is one of my favorites too; so glad you liked it. This recipe is GREAT!!!!! I love it and it totally works for me and my little family of 4 (including 2 babies). We just made it on Sunday and had leftovers for Monday so I could do all the chores I neglected over the weekend instead of cooking! Served with a side salad worked for us! As soon as we're off phase one I might try wheat tortillas, YUM! Mmmmmm I can't wait to try this tonight!! The roast is in the crock pot and is smelling delish already. I'm making black beans/cilantro and a big salad with it…thanks so much!! This was DELICIOUS and super easy! Thanks so much for your wonderful blog…I can't wait to try out more of your recipes!!! Rachel, thanks for the nice feedback. Good luck with the recover too. Kalyn- I am recovering from surgery and needed a crock pot recipe. I found this and I love it!! I have shared your site with a number of people, and have made 4 recipes from your site and they have all been wonderful. Keep up the amazing work! Spence, you're welcome. Glad to hear you enjoyed it! This was a fantastic dish. Thanks. Kristi, thanks so much for taking time to let me know you're enjoying the recipes. Feedback like that just completely makes my day! this was a huge hit at dinner tonight Every night we have tried something new from your blog since we have been doing SB. Tonight, my husband said we have been eating better than he can ever remember, better than restaurants. We love your recipes. I just discovered your blog, these are great recipes for my husband, who is diabetic, I’m adding you to my feed reader right away! 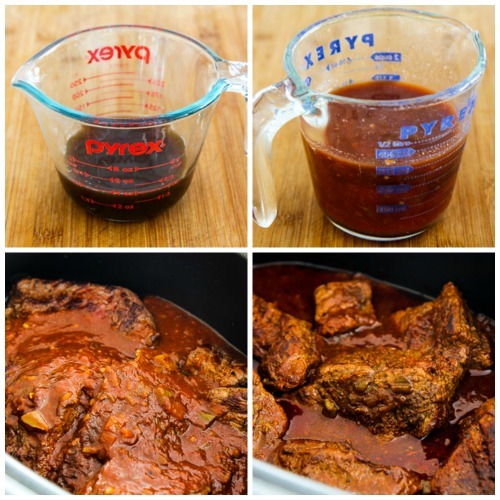 I want to recommend an awesome barbacoa recipe for beef taco meat I just came across which is delicious and easy, using mild ancho chile powder and beef roast. Also check out my cookbook, Diabetic for DH (Dear Hubby) which is full of low carb recipes. All your recipes look really good. Thanx for posting! Once again, I’m not keeping up on responding to comments, but I do appreciate all the nice thoughts. Becky, glad to hear you tried it and liked it. How’s law school going? I always assumed pot roast + slow cooker = Betty Crocker, but this is a great twist and looks delicious. Although I’m in the mood for soup tonight this sounds much BETTER! Yum! If you look up the word “succulent” in the dictionary, it has your picture of that pot roast! :):) Yummm. I gave my slow cooker away a few years ago. Am starting to regret that! Pot roast cooked with salsa sounds really tasty. The pot roast tacos and burritos sound good as well. looks good, i am thinkng to make some vegeterian version of it, by substituting it with aloo tikki 🙂 . thanks for sharing Kalyn 🙂 . It’s rare that I find a crockpot recipe worth repeating. This one looks great! Nice to know that people think this looks good, and also that I’m not the only one who is just remembering the Crockpot this winter. Katie, yes I am dating myself; should remember to call it slow cooker. I just must get my slow-cooker out . . .
I’m glad to see I’m not the only one referring to crock pots (rather than, the apparently more trendy, slow cooker) I thought I was dating myself…probably am! Anyway, I can do this in my oven on the stove top just fine! I wonder how a pork roast with fruity salsa (I love Newman’s own peach salsa) would be. But this sounds amazing. Thanks! Kalyn, thanks for the link to my recipe! This sounds really, really good — I love all your tips for reducing fat in the recipe, as well. Thanks for posting! Thanks for posting this Kalyn…I’m looking for new dishes for the new slow cooker. You read my mind! I’m about to pull out my slow cooker and rummage around in the fridge and pantry. I think I have everything for this recipe. it certainly looks good, i always wanted to make something like this, and now I can! this looks really good—I like the southwestern kick. I’ve bookmarked it to try in the future.